The sales meeting continued the following night and the food wasn't a whole lot better. It was better. No doubt. But not a TON better. 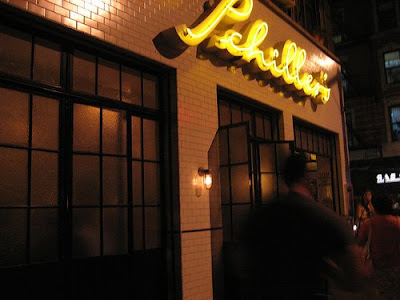 The environment was nice though because Schiller's on the LES is at very least a nice lookin' spot. I had a couple appetizers and one was awesome - some ham and cheese bite thing. It was a little triangle of heart attack. Can't ask for much more than that. For dinner, I had a greek salad, a bit of salmon and some veg and a dessert I can't really remember. As sales meetings go, this one was pretty standard. Nice group. OK food. Lots of drinks. Yep. A sales meeting.